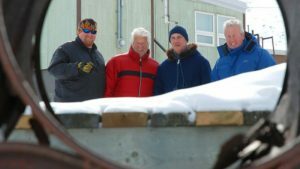 From the 1960s to 1980s, a generation of young men left depressed Scotland to journey to the frozen extremes of the Canadian Arctic to take up work with the Hudson’s Bay Company. Sent to remote outposts, their job was to trade goods for fur with the Inuit, but these young men took on far wider responsibilities: pulling teeth, administering penicillin and even delivering babies. When the fur trade collapsed, instead of coming back to Scotland, many of the Scots stayed in the Arctic, married the natives and set about rebuilding the Inuit communities broken by the dying fur trade. Now, the last of the ‘Bay Boys’ have come together for a hunting trip reunion in order to tell their incredible story. They take us on a spectacular journey through the arctic landscape to relive their dramatic adventures and with emotional encounters with lost friends, reveal how they devoted their lives to repair the damage done to the Inuit communities.